LOUISVILLE, Tenn. (WTVF) — This one stings. Tonight, in the morning and it will probably linger all offseason. Tennessee’s 99-94 overtime loss to Purdue in the South Region semifinals in Louisville hurts so bad for Vols’ fans because this was supposed to be the year. This Tennessee team beat Gonzaga on the way to 19 straight wins, a 22-1 record and the no. 1 ranking in the country. And it was the team that Big Orange faithful thought would take them farther than any Tennessee basketball team has gone before. This was the group that could breakthrough and reach the Final Four. The 45 minutes of basketball at the KFC Yum! Center Thursday did nothing to diminish the love Tennessee fans have for this team, but also deepens the regret about what the season could have been. There was the disastrous start in which Tennessee fell apart on both ends of the floor while Purdue built an 18-point lead. But then came perhaps the most inspired 15 minutes of basketball the Vols have ever played as they clawed all the way back to not just erase the deficit, but take the lead. Grant Williams looked like the two-time SEC Player of the Year with 21 points and Admiral Schofield scored 20 of his 21 in the second half run. Schofield’s fellow senior Kyle Alexander had nine points and eight rebounds, Jordan Bowden chipped in 16 points and Lamonte Turner continued to hit clutch shots when the Vols absolutely needed them. That’s why this team is beloved. It’s a team. And when the chips were down the Vols often dug deep. They hit big shots, fought for stops, battled on the glass and dove on the floor. They were emotional. They were proud. And the thousands of orange-clad fans that followed them to Louisville stood in full throat. Much like its classic SEC Tournament victory over rival Kentucky, Tennessee looked like a team that would not be denied. But, just as it happened in the SEC Tournament final, the Vols ultimately fell short of their goal. Carsen Edwards continued his incredible tournament with 29 more points, and his backcourt mate, Ryan Cline, proved he could shoot from anywhere in the building. Cline scored 27 while connecting on 7-of-10 three-point attempts, including four straight down the stretch that erased Tennessee leads. And, as has happened too often this year, another tight game came down to an official’s whistle. Williams’ putback dunk gave Tennessee an 82-80 lead, but Purdue got one last chance when the ball was knocked out of bounds with just a shade less than three seconds to play. Officials reviewed the call, which was correct and got no protest from any Tennessee player on the court, and added 0.2 seconds to the clock. But the length of the review gave Purdue coach Matt Painter time to draw up a play when he had no timeouts. The resulting inbounds, which was nearly a five-second violation, provided further controversy when Edwards drew a foul when Turner contacted his lower body on an attempted three. Edwards made only two of three free throws – leading many Vol fans to scream, “Ball Don’t Lie” – but the game was destined for overtime, and if you’re being honest, Tennessee was probably more fortunate to be in that position given the way it had played for 40 minutes than it was a victim of any close call in the final seconds. But unlike its second round victory over Iowa, Tennessee failed to find its best basketball in bonus time. And once again there was a mysterious lineup decision from head coach Rick Barnes, who sat Schofield, apparently at the player’s urging, for all of OT Sunday, yet got away with it because the Vols won. On Thursday it was Williams, who was the OT star against the Hawkeyes with six points and an assist on a three, that started the extra session on the bench with four fouls. By the time Barnes put him in Purdue had grabbed a three-point lead that it would never relinquish. The offense went through Williams in overtime against Iowa and Tennessee got a string of quality looks. With Williams on the bench and the Vols then playing catch up, they never found a rhythm in OT against Purdue. And what’s the reason? To save him from fouling out? Williams is Tennessee’s best player and has to be on the floor and trusted to keep himself in the game. 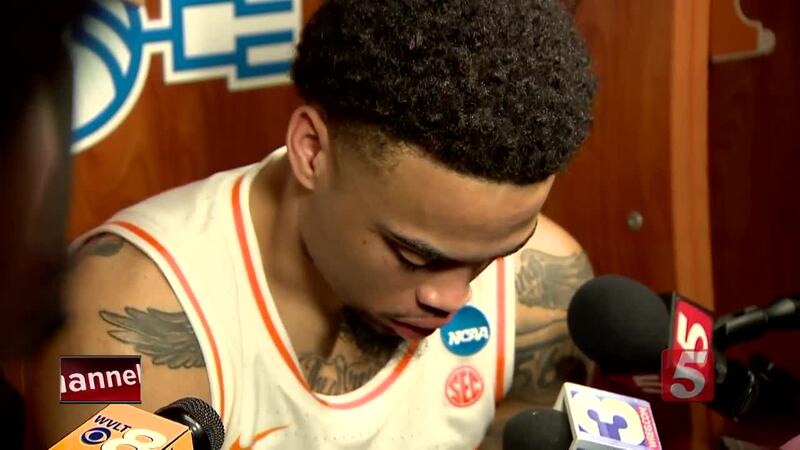 Barnes’ decision may haunt him and the Vols for a long time, and will provide further ammo for the critics of his NCAA Tournament performances. Barnes has led four different schools to the Big Dance 24 times, but is now just 24-24 all-time in the sport’s premier event and only reached the Final Four once. This team appeared for so long to be destined to help Barnes double that total, and hang the first ever men’s basketball Final Four banner in Thompson-Boling Arena. And that missed opportunity will be the main storyline leaving this game. Tennessee tied a school record with 31 wins this season and captured the hearts and minds of its massive fanbase in the process. But it packs up its bags to head home for the final time with nothing to show for it. The Vols fell one game short, losses to Auburn, of both the SEC regular season and tournament titles. And then Thursday dreams of a Final Four and national championship disappeared with one awful half and an inspiring comeback that ultimately, once again, fell just short. You can’t fault the effort. The Vols gave everything they had all season long, cementing their place in the hearts of their fans. But there will be no t-shirts or hats or banners to celebrate this group. And that’s what hurts the most. This was the team that was supposed to make Tennessee basketball history. Until it wasn’t.